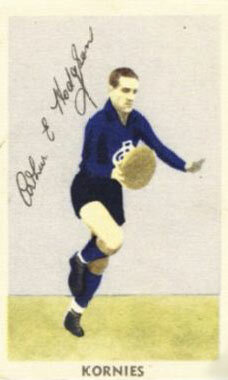 Arthur Hodgson was a journeyman across many states and local competitions of Australian Rules Football, estimated to have played 327 games of senior footy. For most Carlton fans, the most important elements would be Hodgson's 76 games, 7 goals career with the Blues between 1948 - 52 which included our 1949 Grand Final Loss but also Hodgson's 1950 Best & Fairest. Hodgson played in five Australian Carnivals, 1950 for Victoria and 1947, '53, '56, & '58 for Tasmania, representing Tasmania 17 times and Victoria 4 times. He moved on to Tasmania's rugged north west coast to coach Ulverstone between 1953 and 1959, including 4 Premierships: 1953, 55, 56 & 57. Hodgson was born in NSW on January 8, 1926 but moved to Queenstown, Tasmania at age nine. He was recruited from Lyall/Miners United, a club in Queenstown. Simply known as the “Black Prince”, he played with QFA club, Miners United, at age 15. Selected to play in the combined NWFU-NTFA team to play the Air Force in 1945 and a year later won the QFA Best & Fairest award. One of only three players to play in 5 National Carnivals. At many levels, Hodgson had an influence. Contributors to this page: Jarusa , Bombasheldon , molsey , true_blue24 , WillowBlue , pblue , p(12)terg and admin . Page last modified on Monday 15 of May, 2017 11:32:59 AEST by Jarusa. 1987 Rd 12 - Jon Dorotich marks strongly in front of pack.